Tui Shou (Chinese: 推手, pinyin tuī shǒu; Wade-Giles: t’ui shou, pronuciation: soundfile), also called Push Hands or Pushing Hands is a two-person training routine, especially in Taijiquan but also in other internal martial arts. Push Hands as a partner exercise provides a possibility to learn how to deal with incoming power. In contact with a partner, one can thus establish e.g. whether one is correctly centred or double weighted. 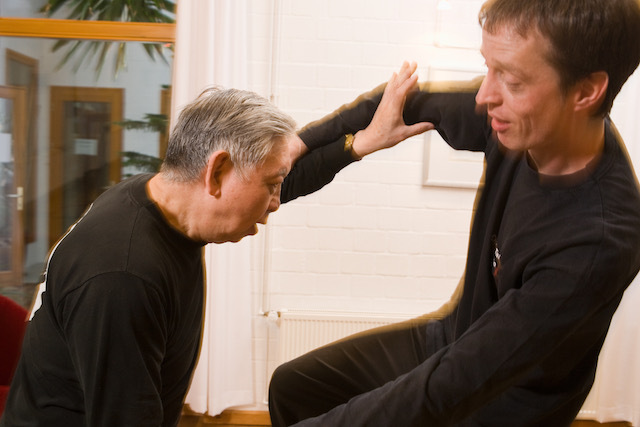 Partner work in Push Hands may also provide hints on how to improve one’s Taijiquan form, following the ideal: Do the form the way you fight and fight the way you do the form. Tuishou is a combination of two characters “tui” (推) and “shou” (手). 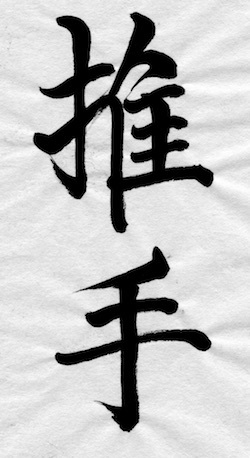 With “tui” meaning to shove, to push forward or to advance and “shou” meaning hand, “tuishou” means pushing hands, sometimes also translated with sticking hands, thus underlining the contact the pushing hands make. Another Chinese expression for Push Hands is “dashou” (打手). “Da” means to strike, to hit or to knock. This expression of “striking hands” tends to emphasise the fighting or attacking aspect of Push Hands practice. Push Hands practice and training methods may vary from strictly formal to form-free. Push Hands practice varies greatly from school to school depending on the focus of practising, which can be anything between wordless body communication, e.g. a practice that highlights the hearing or feeling aspect, and martial arts in a narrower sense, e.g. Push Hands as a basic preparation method for free fighting. fixed step Push Hands (Ding bu tuishou) – Push Hands without moving the feet. moving step Push Hands (Huo bu tuishou) – Here the feet are allowed to move, generally at first back and forth, creating a linear pattern. moving step Push Hands with free stepping, which also involves circling moves. The emerging “final stage” of Push Hands is sometimes termed “luancaihua” – in different traditions either to be translated as “wild flower picking” (derived from the characters 亂採花) or “randomly stepping on flowers” (in Chinese characters: 亂踩花), from “luan” (in disorder, confused), “cai” (either to pluck or to step on) and “hua” (flower). This last variety of Push Hands may almost border on free fighting, but would at first be trained with step restrictions and while maintaining contact, i.e. without hitting or kicking. As a training method, Pushing Hands practises explore the three-dimensional space to train different aspects. 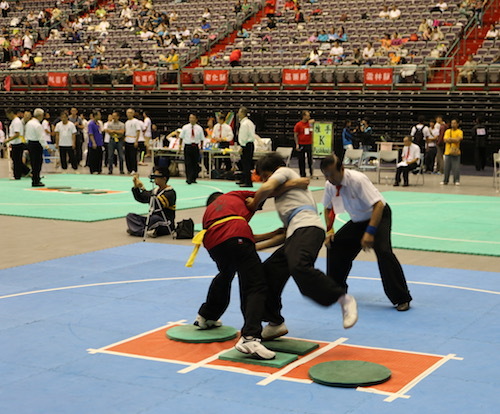 The technical aim is to combine linear techniques as found in Xing Yi Quan with circling techniques which are typical for Baguazhang into a combination of linear and circular, rather oscillating movements, which are visible in the forms of Taijiquan and Liuhebafa. Being independent of style in its free form and rooted in common principles, Push Hands is the main way to exchange knowledge about the Taiji principles and techniques independent of styles and also across different internal martial arts systems. The main principles of Tuishou are illustrations of the basic idea to overcome hardness with softness: Rooting (connecting to the ground), yielding (avoiding and following unconditionally) and neutralizing (going out of the way without losing contact, leading the other into emptiness). This involves recognising and avoiding typical mistakes, e.g. “leaning” (supporting oneself with the help of the other person or being “double weighted”, i.e. being unable to move without prior shifting weight from one leg to the other. – The Classics of Taijiquan simply advise: Adhere (nien), be continuous (lien), Stick (tie), Follow (shi) and “neither pull away nor push back“ (bu diu, bu ding). Some faculties to be trained in Push Hands are: hearing energy (ting jin), the practising of which can be roughly equated to the development of sensibility to incoming forces, and issuing energy, which takes two forms: uprooting (di fang) and explosive emission of energy (fa jin). Far from being mystical, Push Hands aims to develop natural reflexes along the lines described in the Classics: Analysing and using the momentum of the incoming force and thereby refining li (力), i.e. physical force or strength (bare “muscle power”) into jin (勁), which also translates strength, but carries as well the meaning of “energy” or “drive”. The thinking behind this very soft and slow approach to communication and martial arts is that there is always the chance that the person attacking is heavier, faster or stronger (with fists or words) than oneself. The training of reflexes and the understanding of body mechanics aims to develop the capacity of using the momentum of an attack to find an adequate answer even in these disadvantageous circumstances. The Classics express it poetically: “to deflect the momentum of a thousand jin [1 jin = appr. 1 pound], use a trigger force of four ounces”. The 13 basic techniques or basic postures (shi san shi 十三勢) are composed of the 8 doors or eight techniques (Ba men 八門), which are concepts of how to deal with incoming force, and the 5 steps (wu bu 五步), which correspond with five directions of moving. When combined, these five steps and eight postures constitute the original thirteen postures of Taijiquan, from which the Taijiquan forms are derived. The basic patterns of Push Hands differ widely from tradition to tradition. One way to practise the eight doors/eight techniques are the Four Postures and the Da Lu. The following videos show the basic movement pattern of both as practised in the Yang style/Cheng Man Ching lineage of Taijiquan. At a later stage of practising, different directions (clockwise/counter clockwise, parallel to the ground/upwards/downwards etc.) and changes of directions can be freely added by the practitioners. These seemingly simple basic patterns are complemented by countless other patterns with and without stepping. The following sequences are partner routines with Emma Lee and Barry McGinlay. Push Hands can be practised in a cooperative, a non-cooperative or even in a competitive mode. Some schools offer regular Push Hands Training and some regular open training sessions are found in parks, e.g. London Free Open Pushing Hands Tai Chi Session. There are also international exchange meetings for Push Hands, where practitioners of different styles meet and share their experiences, e.g. the International Push Hands Meeting in Hannover, Germany. Push Hands competitions can be found all over the world, many of them termed World (or European,…) Championships, creating many international Push Hands Champions. As there are many different regulations in competitions and the quality of participants differs greatly, competitions and titles are generally not comparable. Some Asian competitions even provide extra competition pools for non-Asian competitors. There is no international standard, i.e. no uniform set of rules for Push Hands competitions. As it is generally the rules that define the actual visual impression of a Push Hands competition, there is a wide spectrum ranging from Push Hands with throws and sweeps or a more wrestling-like style with much movement to competitions with no big outward appearance, e.g. if the regulations narrowly favour the use of “real” Taiji techniques without “raw strength”. Irrespective of the rules, the most common categories are fixed step (Ding bu), which means the feet are not allowed to move, and moving step (Huo bu), which means the feet are allowed to move but there may be moving restrictions or restrictions concerning certain techniques. Competition at Chen village (Chenjiagou), China with Mario Napoli.